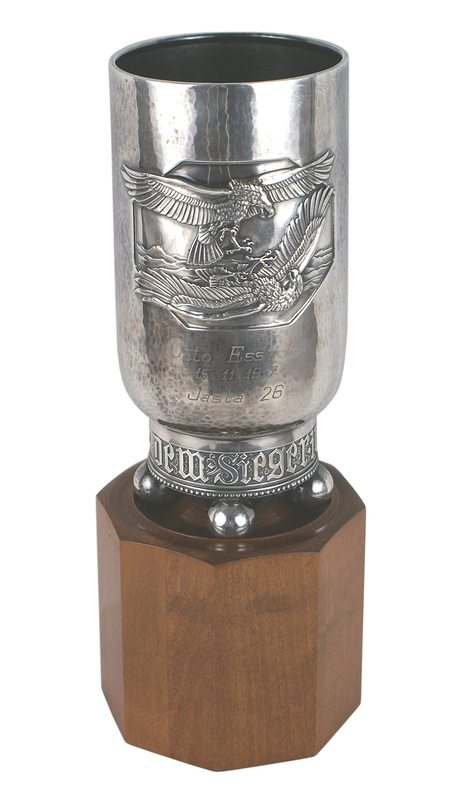 A pokol is a silvered victory goblet, usually issued to a soldier or airman for meritorious service in time of war. The one pictured here shows an embossed panel of two eagles in combat and stands 7 inches tall. The area below the panel is engraved with the recipient's name: “Otto Esswein” and is dated “15-11-1917.” Esswein was a German fighter pilot during World War I. He was credited with 12 aerial victories and he also received the Golden Military Merit Cross. The pokol was part of Mohawk Arms' Auction #75, held June 3-4, but no one offered the minimum bid of $7,500. German World War I and II memorabilia is extremely desirable to collectors. Ironically, many of the items in the Mohawk Arms sale, from World War II, are forbidden for purchase in their native Germany, as the country now considers them disgraceful reminders of a past they'd just as soon forget. Auction #75 also featured the black Nazi Luftwaffe Panzer uniform of Lt. Gen. Wilhelm Schmalz, the commander of Herman Goring's feared Fallschimpanzerkorps (minimum bid: $28,000); and items pertaining to (and even signed by) Baron von Richtofen (“The Red Baron”).